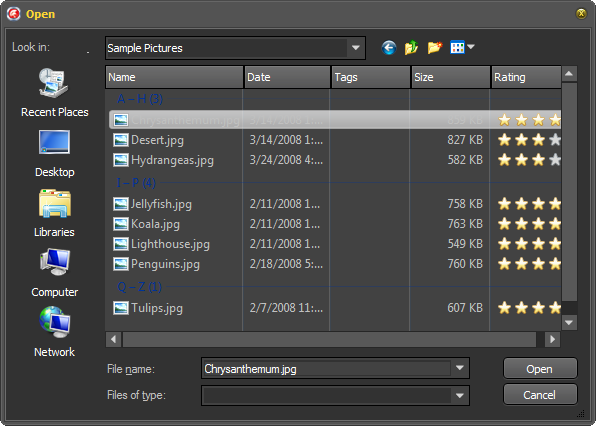 A few days ago KSDev launched a new site, DelphiStyles.com, this new place offers new FMX and VCL Styles. 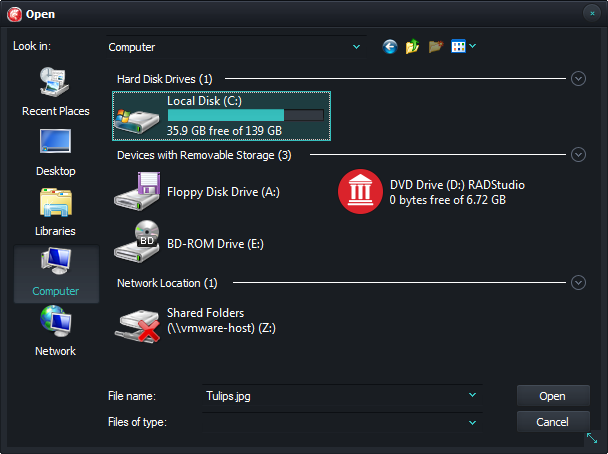 I tested the VCL Styles bundle and are just great, the themes looks modern, sleek and polished. So if you are looking for a professional looking FMX/VCL styles for you application this is the place to go. 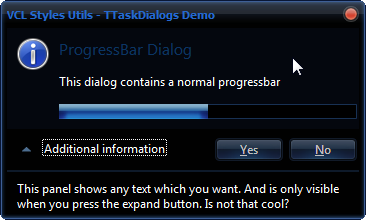 Check out the TOpenDialog component styled using the VCL Style Utils and the DelphiStyles themes. 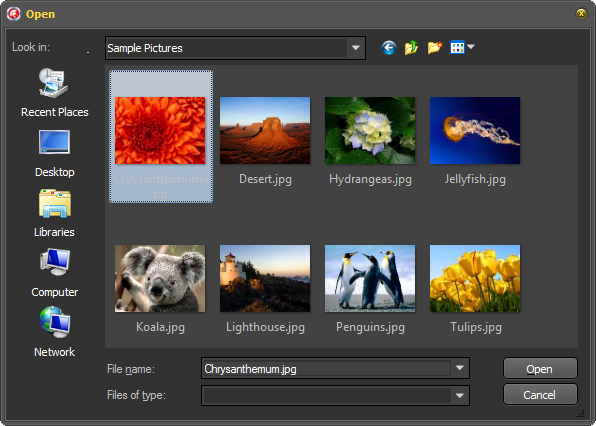 Thanks very much to the guys from DelphiStyle (KSDev) which kindly donated a VCL Styles bundle to The Road to Delphi. 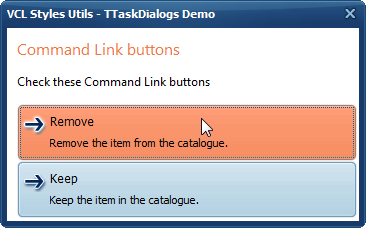 Categories: Delphi, VCL Styles | Tags: Delphi, Vcl Styles, VCL Styles Utils | Permalink. There is a lot of resources of how ownerdraw a Delphi TListView, but most of them are deprecated and don’t take into account the VCL Styles and the StyleServices. So on this post I will show you how you can ownerdraw a TListView to be compatible with the native Windows Look and feel and the VCL Styles. First, there is lot of ways to ownerdraw a TListView , but on this post we will focus only in the OnDrawItem event, because offers more flexibility than the OnCustomDrawXXX events handlers . Sender : The ListView which is raising the event. Item : The list item which need to be drawn. (you can use this object to read the data of the ListView). Rect : The bounds of the item (including the subitems). State : The current state of item. Note: Before to use the OnDrawItem event you must set the value of the property TListView.ownerdraw to True. 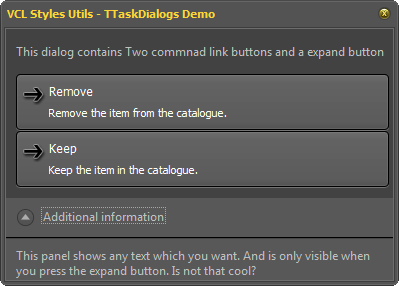 Ok, So I’m planning create a TListview in report mode and draw some controls like a checkbox and progressbar. 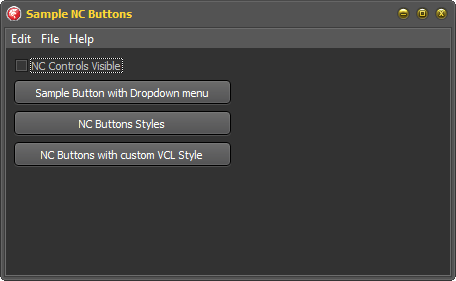 These controls must looks perfect under the Windows UI and the VCL Styles. I will start creating the columns of the TListview in runtime (just for personal preference.). I’m using a TDictionary to hold the columns reference in that way I prevent create one variable per column and also I can access the columns by a Name. Please pay attention to the Tag property of the Columns, I’m using this to store the type of the column (TColumnType is a custom type). Next we need fill the listview with some sample data (This doesn’t requires much explanation right?). And now I can start to draw the TListView items using the the OnDrawItem event. First I will store a reference to the StyleServices function (In this way I’m avoiding call the same function again and again). Note : The StyleServices method returns an instance of a TCustomStyleServices type, which allow to gain access to all the styling functionality of the current active style (Windows or VCL Style). Next I will erase any previous content of the current row by filling with the current clWindow color. Check how the clWindow const is used in the TCustomStyleServices.GetSystemColor function to return the current Window Background color. Now I will iterate over all the columns of the Listview resolving the current column type, the text stored in the current item and calculating the bounds of the current item. Note : The OnDrawItem event is raised once per each row of the ListView, So you must draw all the items and subitems yourself). Now depending of the column type (Text, CheckBox or ProgressBar) I will draw the item. For the columns of type text (ctText), I check if the State of the item is Selected or Hot and Draw the highlight bar (using the TCustomStyleServices.DrawElement method) and finally the text is rendered using the TCustomStyleServices.DrawText function. Check how the color of the text is selected depending of the state of the item. For the checkbox columns, the process start in the same way, first check if the item is highlighted and then the bar is drawn. Then I calculate the bounds of the checkbox and get the text for the column. (for this sample the Value 1 means checked otherwise means unchecked). 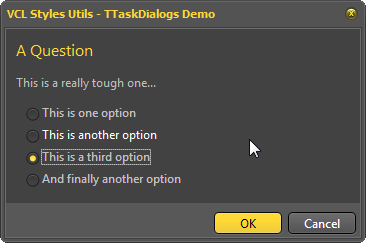 Now according to the value and the state of the checkbox is draw. Please pay attention to how the the element to be drawn is selected depending of the current state and the current text. Finally for the progressbar columns, after of check the current state I draw the frame of the progress bar by using the tpBar element, then getting the current value for the column I calculate the bounds of the chunks to be draw. Then depending of the value I fill the progress bar with a solid color or with the element of the current style. As you can see the list view is draw consistently under Windows or when a custom Style is used. Categories: Delphi, VCL Styles | Tags: Delphi, Vcl Styles | Permalink. 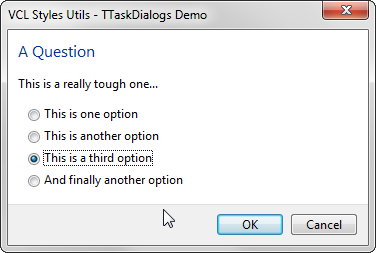 A few moments ago I just made a major commit to the VCL Styles Utils project, Adding support for the New Common Dialogs introduced in Windows Vista. 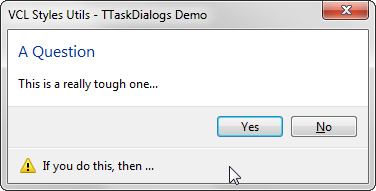 Until now the VCL Styles Utils only was able to hook the older Common Dialogs (Pre-Vista). 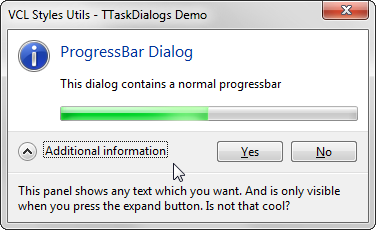 And from now the modern common dialogs are supported too. Important Note : The Windows Classic Theme is not supported. All your feedback is very welcome, remember which you can report issues and make suggestions using the issue page of the project. Categories: Delphi, Github, VCL Styles | Permalink. 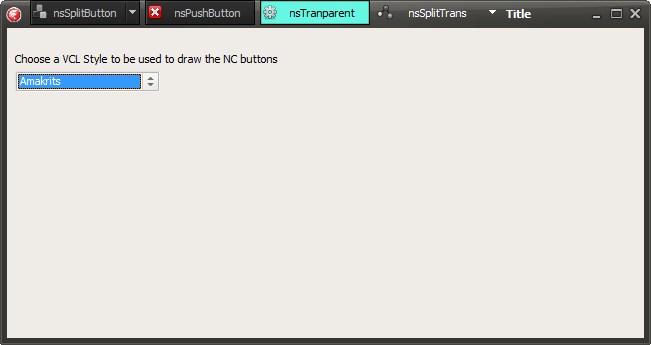 Two new styles was added to the TNCButton control (nsAlpha and nsGradient). So now you can add Alpha-blended and Gradient buttons to the title bar of the Forms. 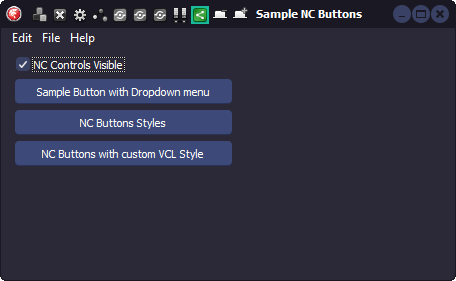 To add a button in the NC Area, only you need add a TNCControls component to your form and then insert a TNCButton in the collection like so. 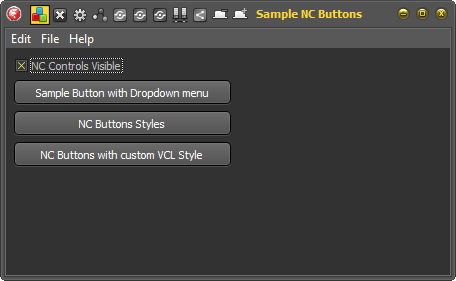 The TNCControls component was updated to support a different custom VCL Style in the NC Area. Check these screenshots with the glow style (this is the application VCL Style) in the body of the form and a custom VCL Style in the NC Area. You can check the sample application here. 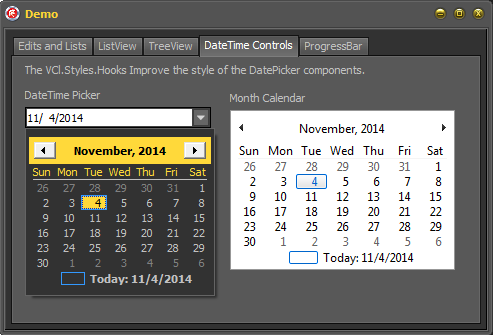 Categories: Delphi, VCL Styles | Tags: Delphi, VCL Styles Utils, VCL-Styles | Permalink. 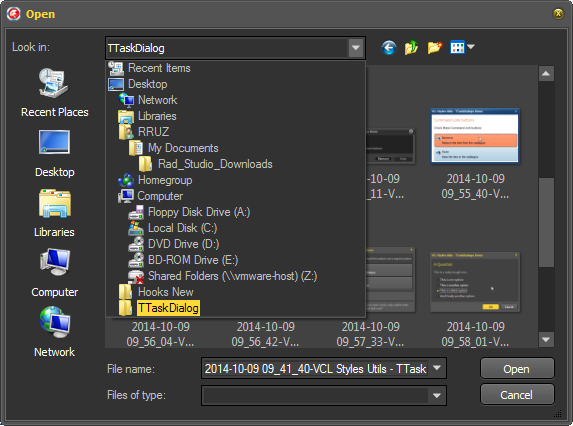 A Major updated was made to the VCL Styles Utils project. This version include several fixes and new features. 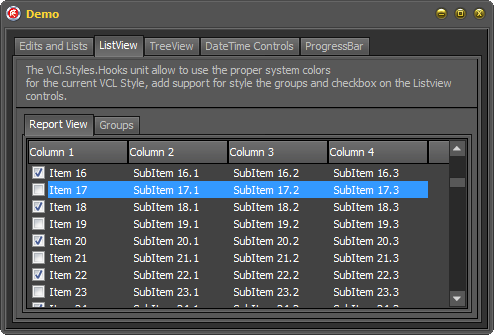 The Vcl.Styles.Hooks unit is the most updated part of this new release. This unit is the responsible of hook some of the UxTheme and WinApi methods like DrawThemeBackground, GetSysColor and GetSysColorBrush. Which allows take the control of the painting process for the system themed (and owner-draw) controls. This new release fix the highlight color used on the selected items and also replace the themed checkBox by a styled checkbox. 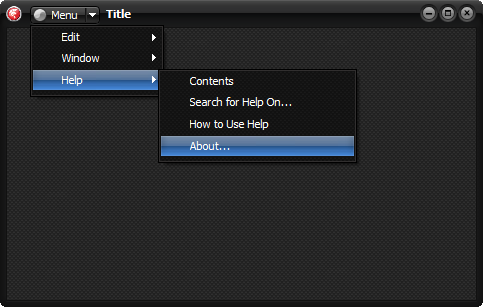 Also was added support for style the Listview groups. 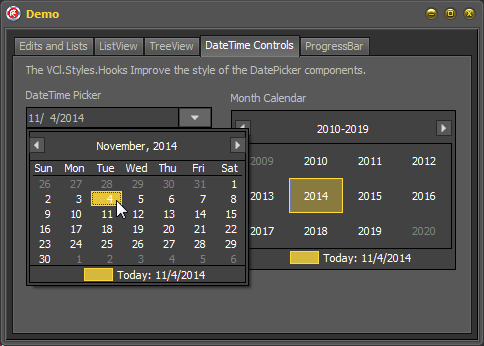 The Styling of the TMonthCalendar and TDatetimepicker components is one of the limitations of the VCL Styles, because such components are owner-draw by the system and doesn’t allow to customize the look and feel when the native themes are enabled (for more information read these TMonthCalendar and TDatetimepicker ) also only the newest versions of Delphi includes a partial styling support for such components. With this new release the styling of these controls is now possible. 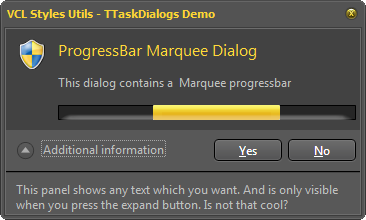 Improved support for the TProgressbar component without flicker and with Marquee style. 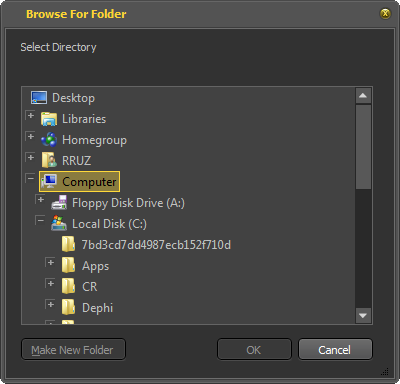 The styling for the select directory dialog was enhanced adding support for the open and close glyphs and fixing the color of the highlight bar. 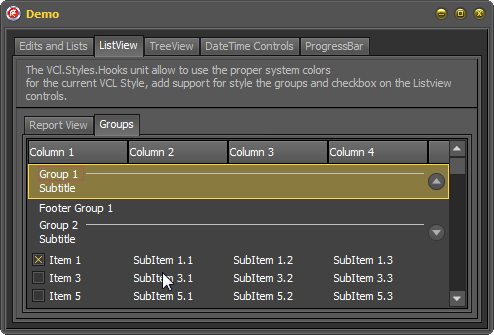 The VCL Styles support of the Open and Save dialogs was improved adding styling for groups and highlight items. 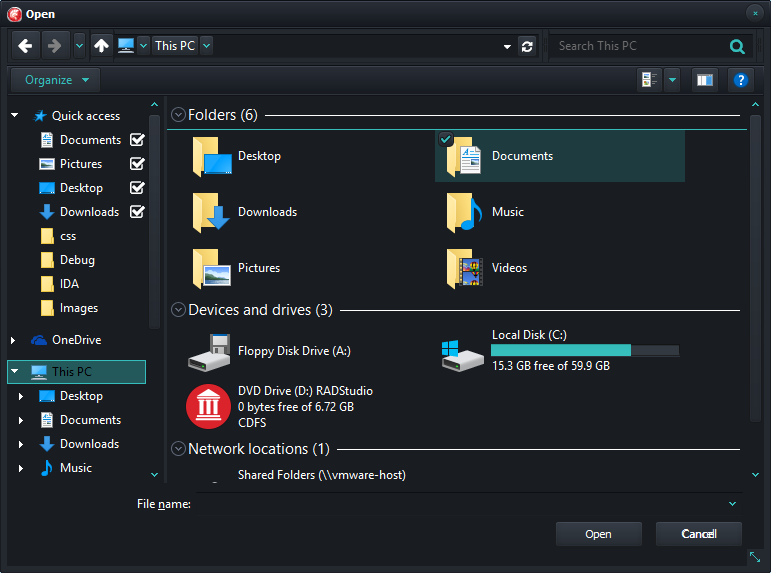 Also a fix for the select folder combobox was introduced. 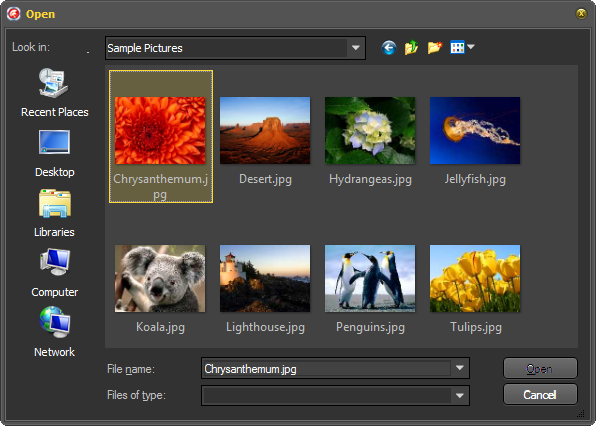 Categories: Delphi, Tools, VCL Styles | Tags: Delphi, Vcl Styles, VCL Styles Utils | Permalink. 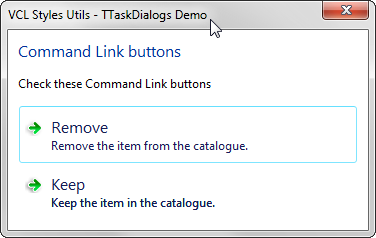 I’m very pleased to introduce a very exciting new feature to the VCL Styles Utils project. 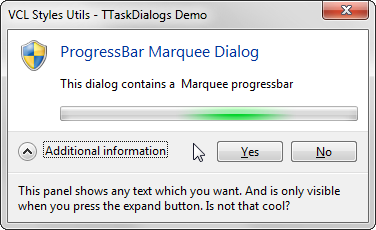 This is the support for style the TTaskDialog component and all the TaskDialog based Message dialogs. 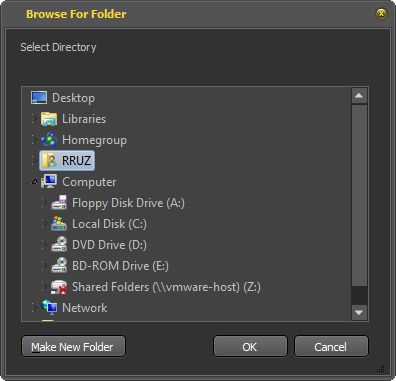 This control available since RAD Studio 2007 is a wrapper for the Task Dialogs introduced in Windows Vista and allows to create very rich and flexible dialogs. 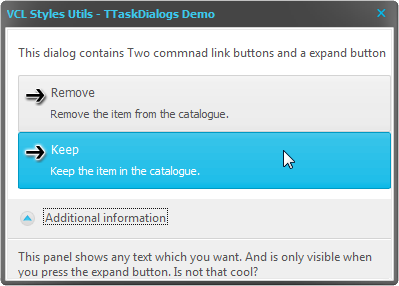 Take a look to some sample dialogs. And now enabling the VCL Styles and just adding the Vcl.Styles.Hooks unit to your project…..
You can download a sample application from the project repository. Also a compiled demo is available here. If you found any bug please use the issue page of the project. 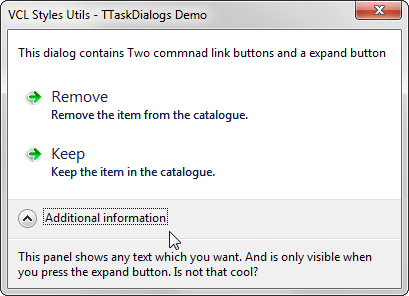 For a quick tutorial of how use the TTaskDialog component check this great Inofficial TTaskDialog Documentation. Categories: Delphi, VCL Styles | Tags: Delphi, VCL, Vcl Styles, VCL Styles Utils | Permalink. 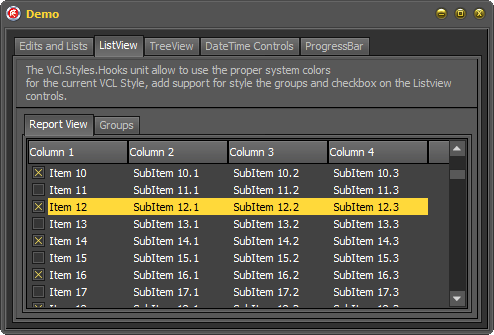 I’m very pleased to introduce a very cool new feature to the VCL Styles Utils project. This is the support for controls in the Non Client Area of the forms through the TNCControls component. Check the next form with the Auric Vcl Style applied. 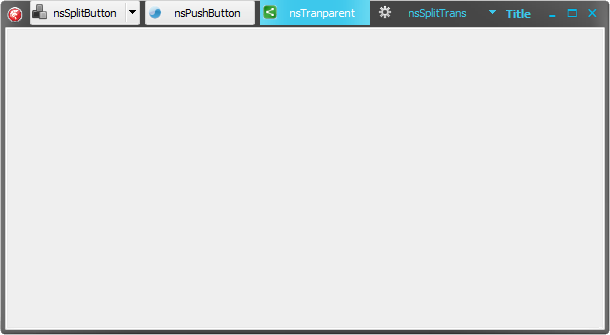 Now the same form but with a set of NC Buttons in the title bar. 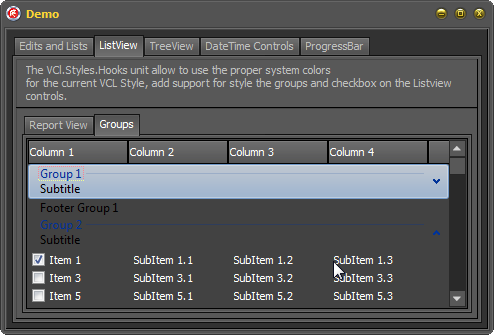 To use in your forms you only need to add the Vcl.Styles.NC and Vcl.Styles.FormStyleHooks units to your project and create a TNCControls component in each form where do you want use the NC Controls. //Assign the menu and events. Exist 4 kind of buttons which you can choose. Also you can use a custom Vcl Style to draw the controls. 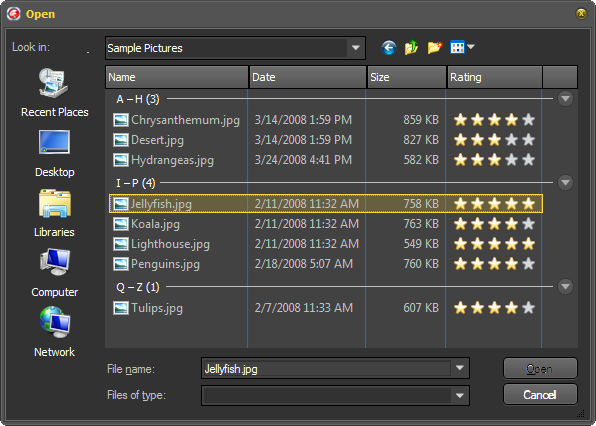 Try the sample application from the project repository. Also you can download a compiled demo from here. Remember report any bug o made your suggestions via the issue page of the project.